I have been working on a custom order this week, an order for a quilt top only as my customer is going to be hand quilting the quilt herself. This makes a nice change from my "normal". Often whilst basting a quilt the thought I'd be quite happy making quilt tops for the rest of my life runs through my mind, and this was my opportunity to sample what I have wished for. It does however feel quite strange to be shipping off a project that is incomplete, and I'm not sure that this is the way to go forth. But I have enjoyed the fabric play for this quilt and there are many I-Spy themes including fabrics with clothing, shoes, cups and saucers, food, bikes, bugs, and fish, and animals. There are also numerous hard to find Heather Ross fabrics as well as other Japanese imports. and has created a fabric mountain of gigantic proportions. Ugh, basting. Surely that's everyone's least favorite, right? it's beautiful, rita! i know what you mean about making quilt tops for the rest of time...that's my favorite part, too! I'm certain the customer will be thrilled with the quilt top and enjoy finishing it off with hand quilting! How else would she ever have such a treasure of different fabrics in one place? What a dreamy selection of fabric. I'm in love with all the prints. Looks good. I love the piecing part best too, but finishing quilts is always good too. Oh my! How large is the quilt and how large are the squares? I am a beginner quilter, and have never "quilted" any of mine yet. I really want to, but don't have a long arm machine and don't know where to begin. I am doing a lap size "arrowhead" quilt right now, that I plan to make my first attempt at quilting it. The fabrics are beautiful - but I'm surprised at the simple square block design. I didn't think experienced quilters ever did simple square blocks once they were more experienced! Ha! I would love to have a quilt like that. 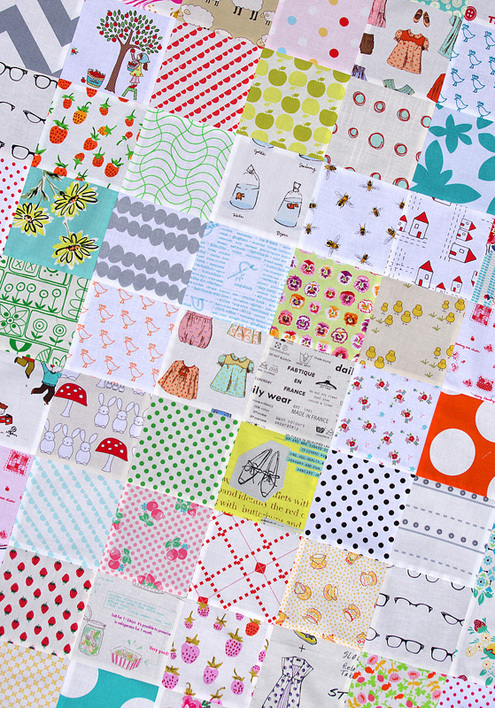 I would examine every little square, I love the variation of prints! 200 fabrics! Amazing. I can understand your feeling sending off something not finished. I don't think I could hand over something if it wasn't finished. I also think I understand the feeling of just doing quilt tops! What a great quilt top. TFS. Your fabric selection is so wonderful! Would be such fun to hand quilt - one would never get bored! Hi There, It's just beautiful!! !That quilt is like going to bed with a read!! !So interesting and so much to see!!! Have an awesome weekend!!! Rita, I don'd comment often but I admire your fabric choices every time! Gorgeous! I love Japanese fabrics and the way you combine them. Now, that's a nice change for you, and I'll bet that it made this project feel like it was finished much quicker. Nice for you, nice for your customer, who can now sit in to hours of happy stitching. Love it, as usual. :) My least fav part of making a quilt is actually cutting everything. So fresh and airy. 200 fabrics!! I spy some Lotta, and love the cute shoes block -- and the polka dots. Rita, I love this quilt. I don't know how you manage to make so many quilts. So pretty in it's simplicity. That must have been a fun project! Your customer is going to enjoy quilting this top so much - what an opportunity to appreciate every fabric! 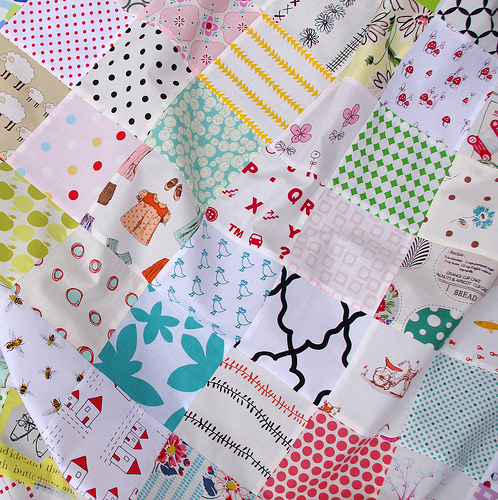 All your fabulous quilting is tiding me over until I can have my sewing machine fixed! Blasted broken pedal :( I miss all the steps! 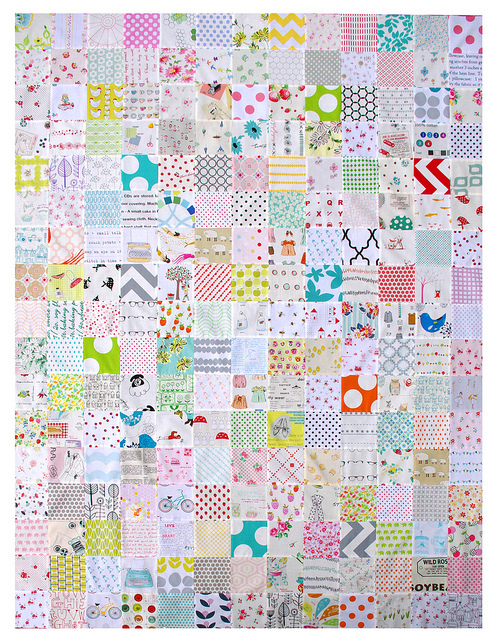 I think I like this little simple squares quilt the best of all the ones you have made. 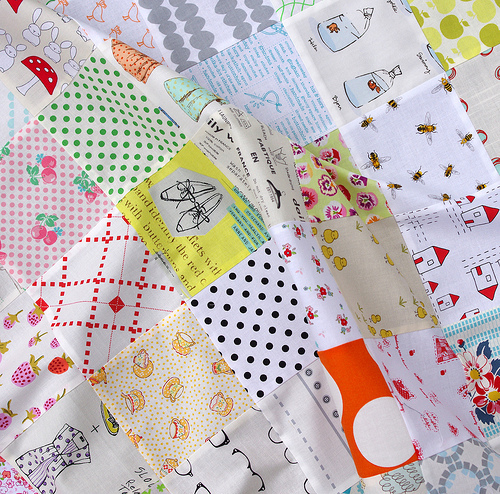 The selection of fabrics just appeal to me so much - and a little giggle here and there too when I look at it as Some of the fussy cut squares are just so cute! Beautiful! Love the fussy cut squares! Amazing. She will love it! Longarmers are in business because they know that many quilters prefer making the top and then having someone else do the quilting. Many still do the hand binding but they have the longarmer attach the binding. Everyone wins if that is what you like to do! I can just imagine the mountain that 200 fabrics made, after you finished cutting squares! So worth the mess for such a lovely quilt top.